Ceramizer engine oil treatment regenerates engines and decreases motor oil consumption. Do you have high fuel consumption? because it creates a coating with a low friction factor and regenerates the engine. Are the engine and gearbox working loudly? smooths the working of the mechanisms. Do you have a problem with gear shifting? thus facilitating gear shifting and reducing discord. Do you want to protect engine and gearbox against wear and tear ? 70 000 kilometers, by adding the best engine oil additive. Are you looking for an effective solution? The effectiveness of the CERAMIZER® oil additive has been confirmed by many tests, experts and drivers' testimonials (over 250 pages and counting). a new technology, which provides for the regeneration of engines, gearboxes, differentials and other devices, where metal to metal friction occurs. A ceramic layer is formed due to the combination and diffusion of Ceramizer® particles with metal particles moving about in the oil. What is important, is that is no need for the dismantling of the device. The process of regeneration and building of a ceramic layer takes place automatically. After 200 km/125 miles from the moment of adding the product (engine additive, gearbox additive) to the oil, the first positive effects are noticeable. Read more in section “How does it work”, and see our tests (including test of driving without engine oil, industrial tests) and testimonials (over 250 pages). Ceramizer® is based on a unique technology that will rebuild and restore worn surfaces by covering them with a ceramic-metal coating. The restoration process is performed without disassembling the affected units, during their normal operation. Just add the Ceramizer® additives to the oil (in the motor, gearbox and power drive systems). 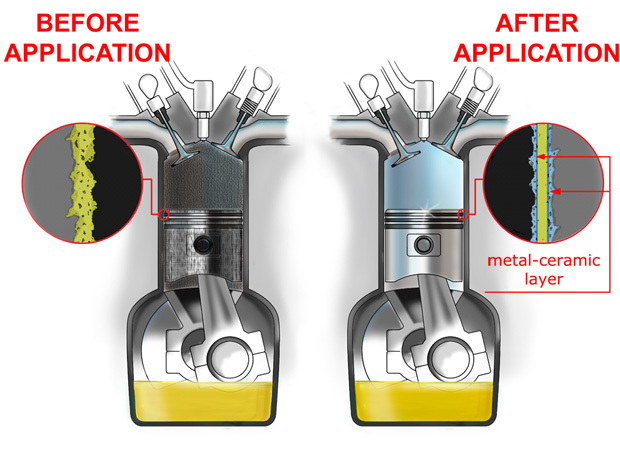 The Ceramizer® is not an oil thickener or so-called “motor-doctor”. One Ceramizer additive dose is only 4 grams. Ceramizer® does not contain teflon, lead or molybdenum. It does not clog oil filters or oil ducts, since Ceramizer® particles are smaller than the filter pores. The effects of engine restoration (engine restore) after adding Ceramizer lasts for 70 000 km / 40 000 miles, even after changing the motor oil. Independent tests and many user testimonials (over 250 pages gathered so far) confirm the complete safety of using Ceramizer engine treatment and gearbox treatment. Are Ceramizers the best engine oil additives and gearbox additives? See for yourself and test them! Decreases oil consumption and so called smoking, restores engine. Equalizes and increases compression pressure in cylinders. Reduces noise and vibration levels. Improves engine starts especially at low temperatures. Improves the dynamics of the vehicle. Helps avoid expensive engine repairs (engine oil treatment). Regenerates and protects motor against wear and tear. Improves driving comfort due to reduction of steering resistance. Ensures fluent and silent work of power steering system in any conditions. Maintains new as well as used devices in the best possible shape. Protects against corrosion and aggresive chemicals. Decreases fuel consumption by 3 to 5 %. Facilitates start of engine, especially at low temperatures. Reduces noise and excessive exhaust smoke (fuel treatment). Reduces negative effects of using lower quality fuel. Prolongs the life of the fuel supply system.